Welcome to our class page! We hope you enjoy reading about our wonderful learning, exciting activities and amazing achievements. 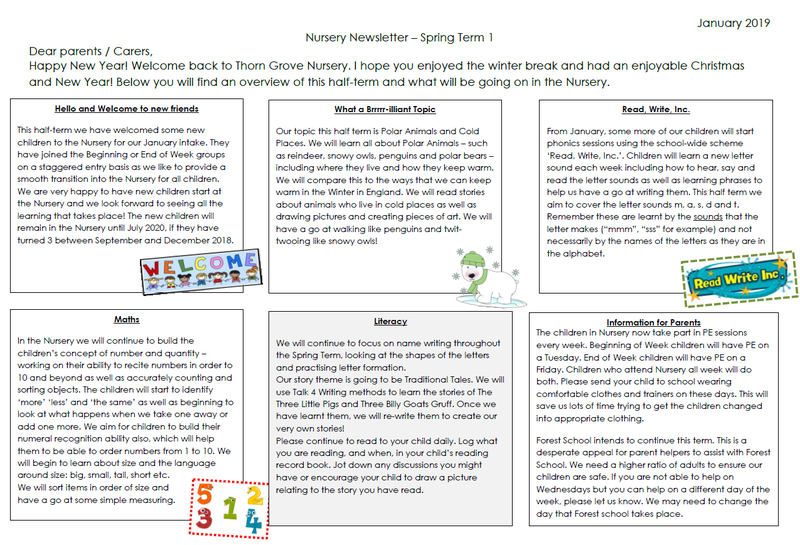 Please keep visiting weekly to find out important information about homework and the latest news on our noticeboard which you can find here. At Thorn Grove Nursery, we have two classes which attend for 2.5 days each week. These are split into Beginning of Week (Monday, Tuesday, and Wednesday AM) and End of Week (Wednesday PM, Thursday and Friday). We take a maximum of 24 children in each class and generally have two admission intakes each academic year in September and January. Since September 2017, we now offer 30 Hours of government-funded provision (a full week Monday-Friday) to children whose parents are eligible. We currently have a small number of children who have taken up these hours. If you are interested, see the school Admissions page under the ‘Our School’ tab or click here for more information. Please be aware that the number of 30-hour places we are able to offer is limited. In the Nursery, the aim is for the children to learn through play and exploring the environment. The day is well structured and the children quickly get used to a daily routine. For most of their ‘learning time’ children can play indoors or outdoors and access activities that support their development in the seven areas of learning, either independently or in a focused activity with an adult. During the children’s independent learning time, adults in the Nursery carry out observations on the children to document their everyday successes and progress. These observations are shared with parents on a half-termly basis via a system called 2 Build a Profile. The children also have short sessions of carpet time throughout the day, where they learn about stories and celebrations, numbers and phonics through adult-led input. for finding your ‘big voice’! Your confidence has really grown in recent weeks and it is lovely to see your personality shining. for your sparkling new confidence! We are so happy to hear that you have found your voice and are no longer worried about coming to Nursery. Read, read, read! Parents, we cannot emphasise the importance of reading enough! We ask that you read regularly with your children and promote their love of stories and tales. From October half term, we will be sending home weekly ‘library books’ from our class book box. Practise telling a story from one of our story maps. Children have been sent home with story maps that we have produced together as a class. These are visual prompts to help children verbally tell stories that they know well. Find a list of our story maps here. All Nursery children should have a pair of wellies in school. There is a box for you to place these in the Nursery cloak room. Please ensure all wellies, along with coats and all items of clothing, are clearly named. Voluntary contributions to our Nursery Resource Fund of £6 per half-term are gratefully accepted. This fund covers the costs of play dough ingredients, baking ingredients as well as being used to recover any general wear and tear of resources – we have had a few people already bring in £6 for the half-term ahead so we would like to thank those generous parents. Children in the Nursery now take part in weekly PE sessions. These are on a Tuesday for Beginning of Week children, and on a Friday for End of Week children. Children attending for 30 hours will do both. Please send your child to school wearing trainers and appropriate clothing on these days. Nursery will be taking part in FOREST SCHOOL Sessions after February half term. Please ensure your child has warm, waterproof outer layers and wellington boots or walking boots. If you are available on Wednesday mornings or afternoons and would like to support as a Forest School volunteer, then please speak to Miss Freebairn. Click here to view the Forest School Handbook. If there is anything on your mind that you would like to ask or let us know, please pop in and see Miss Freebairn or Mrs Yates! For school dinner menus, important dates and other key information, see the Parent Noticeboard in the cloakroom area outside the Nursery classroom.